The first time I saw Elena Mary Siff’s mixed media collage, “The Thorny Road of Honour”, I was instantly transported to nights during my childhood when my mother would read books to me before bed. I would snuggle into my blankets and pillows and listen intently as she would read the story, but before she would turn a page, I would make her let me examine every detail of each picture. This undeniable fascination is exactly what Siff inspires with her intricate and vividly fantastical pieces of art. 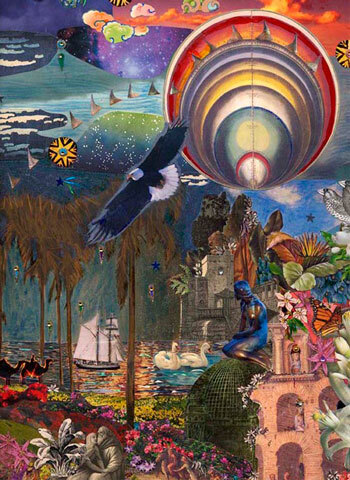 The dreamscape includes a variety of flora and fauna, a tower, a ship, a fortress, and sculptures. There is an ocean in the sky and a brightly colored vessel-like object that hangs in mid-air, but somehow it all makes sense and comes together to create a harmonious world that beckons to be explored. Luckily for me and other art-loving Angelenos, I can explore Siff’s work in person for hours on end at Santa Monica’s Bergamot Station. “The Thorny Road of Honour” is currently on display as part of Siff’s “Mixing Media” exhibit at the First Independent Gallery, also known as FIG, and can be viewed Wednesdays-Saturdays until October 4th. TBT – Fresh Prince of Bel Air!